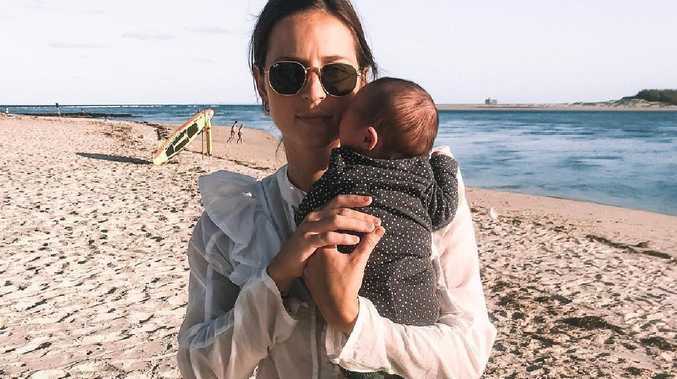 Nicole with her newborn baby girl, Zephi Lou Doyle, has stunned social media with her four week transformation. 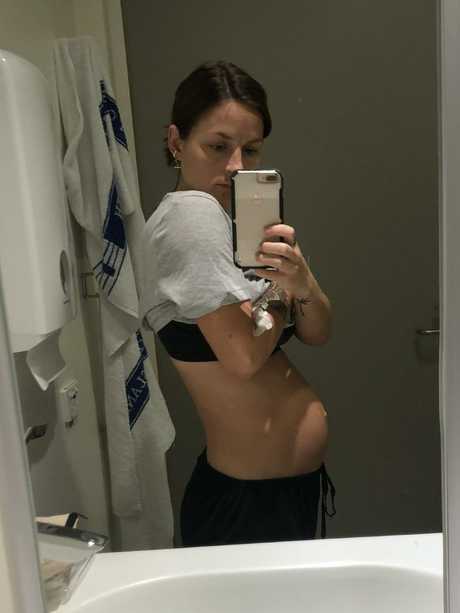 IT'S hard to believe that just four weeks ago, Nicole Knight was heavily pregnant with her second child. 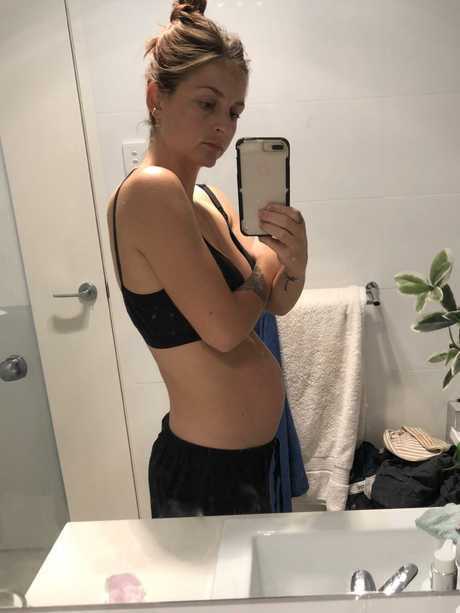 The mother-of-two from the Sunshine Coast gave birth to her second baby in October and bounced back close to her pre-body weight within the month, despite putting on a healthy 13kg during pregnancy. The 25-year-old said her transformation comes down to genetics and a healthy lifestyle, saying she tried to maintain her 80:20 diet and exercise throughout both of her pregnancies. "I like to live an active healthy lifestyle," she told news.com.au. "Growing up, I always played sports and played outside and I've continued that into my life now. "I try to incorporate an active lifestyle into my every day by playing outside with Aspen, walking to the park, going for bike rides and walking along the beach." Nicole Knight pregnant and four weeks later. 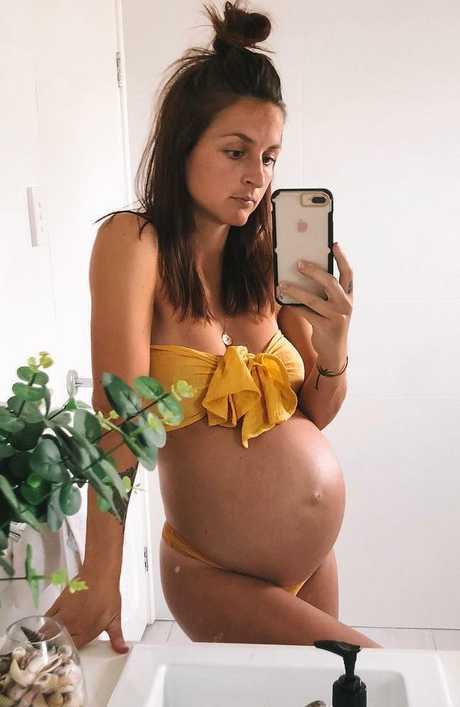 Ms Knight said it was very important to her not to exclude all the foods she enjoyed both pre, during and post pregnancy - and if her body craved a certain food, she would indulge. "It's important to be fit and healthy pre pregnancy, during pregnancy and then post," she said. "Because I have always lived such a healthy active lifestyle my body responds fast and really well to healthy eating. "In both pregnancies I still gained about 13kg. Three weeks post pregnancy with Zephi, I was still 7kg heavier than pre pregnancy." Typically, a day on a plate for Ms Knight will include a green smoothie for breakfast, tuna and avocado on rice thins for morning tea and some spaghetti bolognese for lunch. Nicole shows off her figure two weeks post baby. In the afternoon, she tends to snack on fruit or carrot sticks and peanut butter, followed by salmon and veggies or lasagne for dinner. And if you think she skips dessert, you'd be wrong. Before bed, she'll have a hot chocolate, more fruit and yoghurt or some ice cream. "Honestly if I'm maintaining weight I eat a very flexible diet and I eat chocolate if I want it or cake," she explained. I'm just very conscious about what I eat in the fact that if I eat chocolate I don't eat a whole block. Or if I want brownies I eat them, I just try to make home baked healthier options. "I'm a huge believer in 80 per cent healthy food and 20 per cent naughty foods." Nicole on her due date at 40 weeks pregnant. The 25-year-old put on 13kg during both her first and second pregnancy. But Ms Knight said her secret isn't to cut out all food all of the time. "If I want to eat pizza or burgers or hot chips I do, I just make healthier choices," she explained. "For instance, if I want burgers for dinner I will make my own burger patty and choose healthier toppings, plus I will make my own sweet potato chips for the side. "It's important to not be too strict on yourself and eat foods that you enjoy … but at the same time it's important to be conscious about what you put into your body." According to experts, there are no set recommendations for how quickly you should return to your pre-pregnancy weight after having a baby. But it is important to lose your pregnancy weight at some point so it is not carried through to your next pregnancy, or into later life. Each woman's weight loss experience will be slightly different. Most studies show women retain about 1-5.5 kilograms at 6-12 months after pregnancy. In a study published on The Conversation, research found three out of every four women retained some of their pregnancy weight six months after the birth, and one in three retained more than 5 kgs. Nicole Knight one day post-partum. Very low energy diets or fad diets are not recommended during pregnancy nor immediately following birth. Trying to lose weight too fast can mean your food choices are less likely to provide a good balance of nutrients, which are needed while your body gets back to a non-pregnant state and for breastfeeding. Ms Knight said while she maintains a healthy lifestyle, there's no secret potion or magic trick to dropping the post-pregnancy weight quickly. And despite some negative comments around her body shape, she says it's given her a thicker skin. "I get a lot of positive + negative [comments]," she explained. "It is from a lot of women body shaming me with horrible comments but I just delete the comments and carry on with my day. Fortunately negative comments have taught me to have thick skin. Nicole Knight says she tries to work out 3-5 times a week by walking or going to the gym. "I am obviously very blessed that its in my genetic make up that I am tall and thin plus I have a very fast metabolism," she said. "But in saying that I also look after my body and ensure that my metabolism is fast by eating good wholesome foods. "I understand first hand how hard it can be when you have a new baby and you're exhausted, don't want to be active and just want to eat unhealthy comfort food. "But trust me, putting in the effort to eat wholesome foods makes everything 100% better." Nicole Knight two days post partum.